Peru. Loreto Region. 80 km downriver from Iquitos City. Yanamono Communal Reserve. IVO Heliconia Amazon River Lodge. Adult females = 33.5 mm, the males are normally smaller. The skin on back and upper side of the hind legs is clearly granular, the skin on the belly and underside of the limbs is smooth. The first finger is longer then the second and between the toes rudimentary webbings are present. The colour of the back is dark brown, on both sides a golden or yellow (Ecuador, Peru) or white (Brazil, Guyana) dorsolateral stripe, from loin to flank and over the eye to the snout. A second stripe goes from front legs to the snout. The flanks are black. The ventrolateral stripes (from loin to front legs) are white or blue-white in the western area of the distribution area to silver-white in animals from Brazil and Guyanas. The upper side of the legs is light brown or grey with spots. On top of the upper arm is a bright yellow or orange spot. In the loin is a similar yellow or orange spot bordered with black. Behind the thigh is a red stripe. 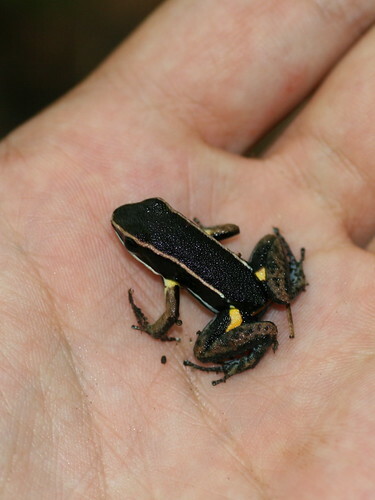 The underside of the body and legs is black, brown (Ecuador) or grey with blue-white marbled pattern. The iris is black with a golden ring, brown with red or bronze (Ecuador). Females lay eggs on leafnests and tadpoles are transported later by the male to a temporarypuddle.